Please Take The New DCSS Player Survey! The 0.18 tournament will begin in just over a week! From 20:00 UTC Friday 6 May through 20:00 UTC Sunday 22 May, any 0.18 game played on any of the online servers will count for the tournament. 0.18 will be officially released a few days before the start of the tournament. The rules page will contain all the details about how to score points and earn banners in the tournament. We’re still settling on the rules for this tournament, but they’ll probably be pretty similar to previous years’. The 0.17 tournament is over. For 16 days, players could compete for tournament points and banners by playing 0.17 games on the public servers. The winning player was cosmonaut, with 5787 points. cosmonaut won 22 games during the tournament, including a 5-game streak, and won 15 tier-three banners. In second place was johnnyzero, with 5644 points and 17 wins, including the longest streak for 10 games. In third place was iafm, with 5432 points and 27 wins, the most wins of any player, and 16 tier-three banners. EnterQ won the most tier-three banners of the tournament, getting 20 of 22 possible. The only unwon banner was Ruthless Efficiency III. The fastest win by turncount was achieved by 4thArraOfDagon (19225 turns with a VSMo of Cheibriados). This game was also the highest scoring win of the tournament at 74M points, and incredibly is the second-highest-scoring game among all online games ever played! Demise had the fastest realtime win at 57m 37s with a HOBe, and johnnyzero had the lowest level win with an XL 19 FeAE of Dithmenos. The first victory of the tournament was claimed by CcS, playing a MiMo of Cheibriados, just 86 minutes after tournament start, followed by lessens a mere 32 seconds later, playing a MiBe. The clan competition was won by tasonir’s clan (17151 points), followed by Vidiiot’s clan (16340 points), and MorganLeah’s clan (14161 points). There were 167 clans in all with points scored in the tournament. 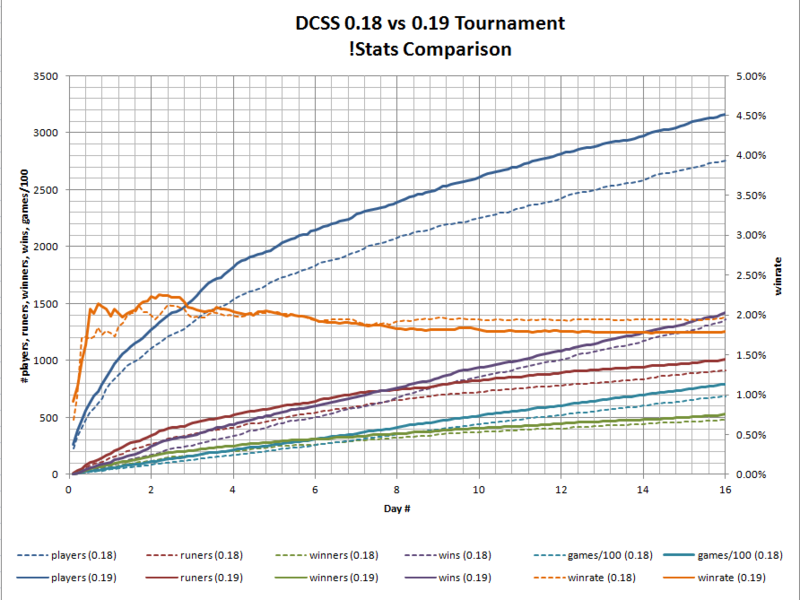 A graph made by johnstein shows how various statistics progressed over the course of the tournament. See here for additional comparison graphs. 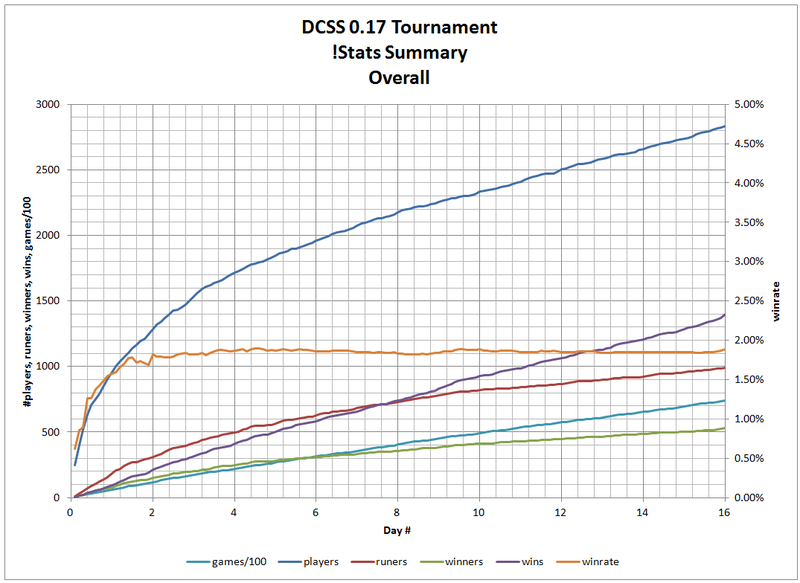 On behalf of the Dev Team, many thanks to all the server admins, outside contributors, bug reporters, and to the many DCSS players, new and centuryplayer alike, who made the 0.17 release and tournament possible! We have now have the official page for the 0.17 Tournament online! Bookmark that URL, since it will eventually have a nice leader-board with links to all tournament results for players, clans, and banners, as well as a table of ongoing tournament games. The page currently shows the 0.17 tournament rules, included the rule changes from the 0.16 tournament. This biggest change is that Beogh’s Saint banner has been reworked and is now called Heretic. This banner rewards players for abandoning and mollifying one, three, or nine gods, excluding Beogh, Ely, Ru, TSO, and Zin. There’s no longer a clan-based banner, but clans are still tracked with clan points awarded in all the various ways. Gone are the days when Saint I was either a trivial banner or perhaps the most difficult one if you were in a high scoring clan! Hopefully enduring epic god wrath will also make for some memorable games. Lugonu’s Heretic banner has been renamed to Spiteful, which has the same rules but no longer rewards tournament points for the tier 3 banner. Nemelex’ Choice bonus points are now awarded to the first eight winning players instead of the first seven. Lord of Darkness III allows you to enter Temple. No more altar grinding required! Angel of Justice III requires that you kill the Serpent of Hell at least once. Remember, the tournament will take place from 20:00 UTC Friday 6th November to 20:00 UTC Sunday 22nd November. If you’re participating in a clan, don’t forget to edit your RC file per the instructions. Clan memberships can be changed during the tournament (with changes detected automatically) until 19:00 UTC Saturday 14 November, after which time clans are effectively frozen. Note that for testing purposes, the tournament page is currently tracking all games played in November. Don’t worry about any tournament results you see listed now, since the database and pages will be reset before the start of the actual tournament. Finally, the tournament page may get a visual overhaul thanks to work being done by chequers, the CPO admin who also helped overhaul the crawl.develz.org homepage. If we get these changes incorporated in time for this tournament, you’ll see them automatically when you visit the tournament page. The 0.16 tournament is over. For 16 days, players could compete for tournament points and banners by playing 0.16 games on the public servers. The winning player was DrKe, with 5915 points. DrKe won 19 games during the tournament, including an 8-game streak and the second-fastest win by turncount. In second place was Zooty, with 5694 points and 18 wins, including the longest streak (13 games, tied with WalkerBoh). In third place was Yermak, with 5398 points and 23 wins. Yermak was the only player to receive all 22 Tier III banners during the tournament (though teammate Zooty stole the Saint III banner in the end). The fastest wins in the tournament were achieved by damdam (turncount, 13705 turns with a DDFi of Jiyva) and simm (realtime, 48m 10s with a MiBe). Tabstorm had the highest score, 56M points with a DDBe. joy1999 had the lowest level win, an XL 14 FeEn of Ru that sacrificed two experience levels to Ru and also died twice on the orbrun. The first victory of the tournament was claimed by lessens just 75 minutes after tournament start. The clan competition was won by Cheighis Khan (20656 points). Kikus Delivery Service (19082 points) and AWBW – Ru-Tang is for the Children (18347 points) were second and third respectively. There were 162 clans in all. 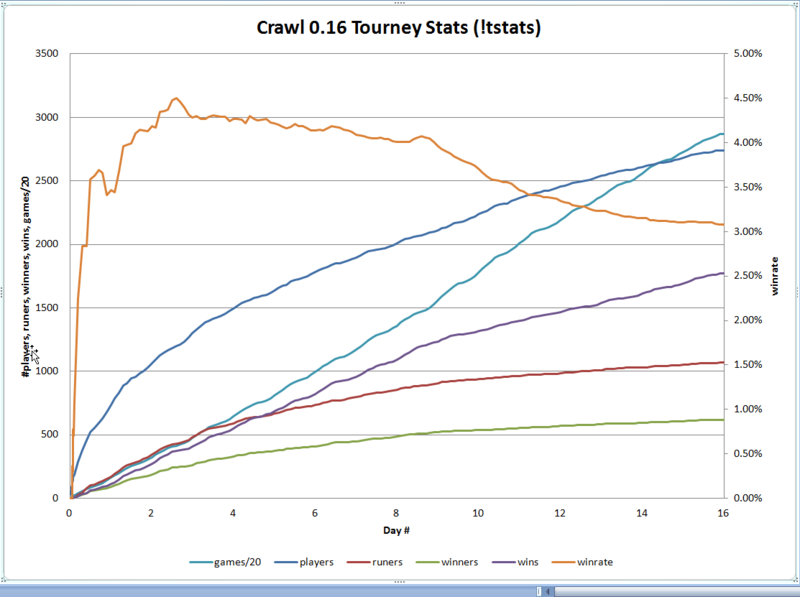 A graph made by johnstein shows how various statistics progressed over the course of the tournament. We’ve issued a new stable version of DCSS that contains an important fix for a bug affecting version 0.16.0 where all melee damage done by the player is approximately doubled. This bug only affects player melee, not ranged or spells, and doesn’t affect monster damage at all. It has a dramatic effect on game balance, so it’s strongly recommended that all 0.16.0 users upgrade. All operating systems have 0.16.1 binaries available on the download page above. When this bug was discovered, the development team decided (after some deliberation) that it’d be better to fix it immediately, since otherwise many would choose to stop playing online until it was fixed. Nearly all online games played during the 0.16 tournament were affected up until the fix, namely any game played from version 0.16.0 to version 0.16.0-17-g811c1d7. The fix in version 0.16.0-18-g484a79e was made on Sun, 22 Mar 14:24 UTC, however server updates took some time, and not every server was able to be updated at the same time. For any completed game, the morgue file shows the exact crawl version played at the top of the file (these morgues are linked to on the player tournament pages). Note that this is only the version when the game ended, and some games were played in-part with the affected versions but transferred to a fixed later version. This bug likewise affected online trunk games played from versions 0.17-a0-22-ge0bdd66 to 0.17-a0-123-gf2c12c4. There’s no plan to change anything relative to the tournament (including scoring) now that the bug is fixed. Artefacts with the Contam property are no longer marked as chaotic and hence hated by Zin, since Zin wouldn’t give penance for using e.g. weapons with this property anyhow. There’s now a warning under Zin when Contam items are removed, since this does incur penance. For the debian version, build against less recent dependencies to support a wider range of OS. NOTE: the developer who introduced this bug has gone AWOL, and we’re trying to track him down. If you see this person, please report him to your nearest centuryplayer. 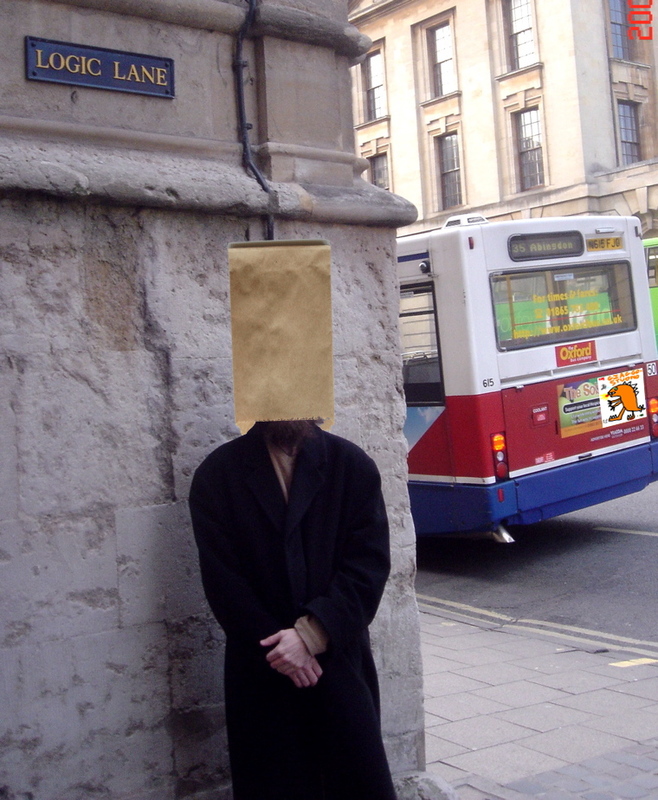 Do not approach him, as he is bugged and extremely winscumming.